I got a rather charming drawing of Ambrosius from Sword at Sunset, for Sutcliff Swap. I like it a lot. Writing this turned out to be quite hard work, because I have this great desire to fit historical stories into wider events of the period, and working out who does what in what order, during the late sixth century is confusing, to say the least. I think Sutcliff gave up too, because she invented a Prince of Powys to fight at the battle of Wodensbeorg, rather than using any of the plethora of Powys princes / kings who seem to have been wandering around at the time. So I wanted to give Powys back its probably-historical ruler, and also explain how 'Gerontius' from Dawn Wind might have been connected to him. I thought I'd finished this when I posted it to the Sutcliff Swap collection, but now I'm wondering if I want to write more about Taliesin. He seems to be quite a strong personality. So this was why I was canvassing opinions on the clothing of Norman minstrels recently:I was attempting to draw Herluin, Robert de Bellême's tall, skinny, sarcastic minstrel from Knight's Fee. 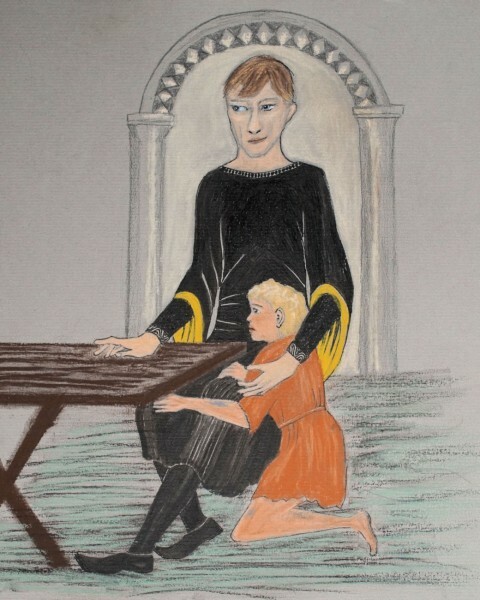 The child is the protagonist, haf-Saxon Randal the dog-boy, who accidentally drops a fig on his master's horse's nose, and is threatened with a thrashing for it. Herluin rescues him by threatening Randal's master with the terrible fate of having a funny song written about his overreacting to the Dropped Fig Disaster. Herluin's clothing is described as black (which is not supported by any of the references anyone suggested to me, which were all quite bright, but oh well.) His sleeves are described as 'fantastical'. I think maybe I should have redrawn Randal's head, which is a bit too small in proportion to everything else. Oh well! H like the drawing (and your story is on my to read list). Coincidentally, I am part-way through Michael Wood's In Search of the Dark Ages. In Search of the Dark Ages is very readable. I like Michael Wood as a presenter, too. I fully agree, on both counts. I didn't see the TV series, but I can still imagine him saying every sentence in the book. I met him once! Very briefly, but I spoke to him, and he was great. Good to see the result of the great minstrel discussion! I hadn't guessed at all that it referred to that scene. Also, I like your idea of including Taliesin in the fic and what you did with that.